Maremmana Bull. Photo: Marco Di Luca. In author Mario Melletti's previous post he explored the impact of feral water buffalo on Australian ecosystems. Here, he talks about the main steps that have brought us the wide range of modern cattle breeds through the process of domestication of their ancestor, the aurochs. The link between wild cattle and humans has existed for thousands of years. Five species of wild cattle have been domesticated approximately in the last 10500 years (Helmer et al. 2005). This domestication process has provided many benefits to humans, from meat and milk, to draught animals (see also Chapter 3 in my book for more details). Wild cattle are therefore valuable today as a genetic pool for ensuring that domestic breeds can adapt to changing pressures, such as climate and disease (Melletti & Burton 2014). Nowadays, our understanding of the early history of cattle domestication is based mainly on analysis of mitochondrial DNA (Groeneveld et al. 2010). Approximately 8500 years BC, after the domestications of sheep and goat, taurine cattle were domesticated in the Near East from the wild and now extinct aurochs (Bos primigenius, Helmer et al. 2005; Bollongino et al. 2012). The first domestic cattle was a form with long horns, a phenotype that is still common in several British, French, Mediterranean and African breeds. About 3000 years BC the first cattle with short horns appeared in Mesopotamia. This phenotype was more suitable for those habitats and replaced by a second wave of migrations (Epstein & Mason 1984) most long-horns forms in Asia and neighbouring continents, reaching Britain around 1000-2000 years BC. This short-horns cattle was the most common form in Europe from about 1000 years BC (Lenstra et al. 2014). Remains of Neolithic farms in Europe revealed that cattle migrated along two routes, the Mediterranean coasts and the Danube river, respectively, arriving in the North Sea coasts around 3000 years BC (Barker 1985). Moreover, North Asia might have been colonized through the Caucasus route. Going back in time, from about 4000-5000 years BC, cattle also migrated into Africa (Hodges & Payne 1997). Other large-scale migrations of cattle were linked to the migrations of Germanic people during the collapse of the Western Roman Empire (Lenstra et al. 2014). For example the widespread modern zebu was domesticated about 6000 years BC from its ancestor the aurochs (Bos primigenius namadicus) in the Indus Valley and acquired its characteristic hump only after domestication. After that, zebu has spread from the Indus Valley to the tropical zones of most continents (Ajmone-Marsan et al. 2010) reaching China, Indochina and Indonesia. A further movement westward, from 2000 years BC, brought zebu to Africa. Besides aurochs, other wild cattle have been domesticated in the last 7000 years. For example, banteng may have been domesticated in Southeast Asia about 5000 years BC (Felius 1995). Gayal or mithun, the domestic form of gaur (Bos gaurus), it is distributed in Assam and Myanmar and it is used mainly for ceremonial purposes. About 2500 years BC a domestic form of the wild yak (Bos mutus) was selected and now occupies a large region on the Qinghai-Tibetan Plateau and adjacent areas above 3000 m (Wiener et al. 2003). The modern swamp buffalo derived by domestication of wild water buffalo (Bubalus arnee). Recent mtDNA analyses (Zhang et al. 2011), combined with archaeological evidence, indicate buffalo domestication in South China and/or Indochina around 2000 BC. The domestication of the swamp buffalo coincides with the start of the rice cultivation where a strong animal for ploughing the rice fields was necessary (Lenstra et al. 2014). Finally river buffalo, another phenotype derived by wild water buffalo, has been domesticated about 2500 years BC in the Indus Valley (Kumar et al. 2007). It seems that these animals were not known in the Roman Empire, which indicates that river buffalo arrived in the western regions after its domestication (Lenstra et al. 2014). The distribution of cattle in different regions of the world led to the development of several ecotypes adapted to their local environments (Lenstra et al. 2014). In addition, human selection generated many different “agrotypes”, which preceded the formation of breeds that differ in coat colour, horns development and docility. In the last 200 years, cattle diversity has been increased by systematic selection of isolated populations that became the present breeds. When dairy production (Barker 1985) started many cattle have acquired, for example, large udders. The process of the domestication resulted in a decrease of size, which continued until the Middle Ages but it was less pronounced in long-horned Italian forms and draught cattle (Lenstra et al. 2014). The 18th century saw the birth of the first breed. Systematic, selective breeding and genetic isolation finally led to the development of hundreds of different breeds, which over time became also integral parts of local tradition (Felius 1995). From the beginning, most bovine species are still used in religious rituals, festivals, races and fighting games. The variety of breeds across the Continents not only maintains the diversity of the genetic resources but also preserves a potential adaptation to other environments and climate change (Lenstra et al. 2014). Finally, we cannot forget how many benefits wild cattle, through the process of domestication, have brought to human being in the last thousands years. We should keep in mind this, considering that most wild cattle species are still overlooked and severely threatened by human pressure. Ajmone-Marsan, P., Garcia, J. F. & Lenstra, J. A. (2010). 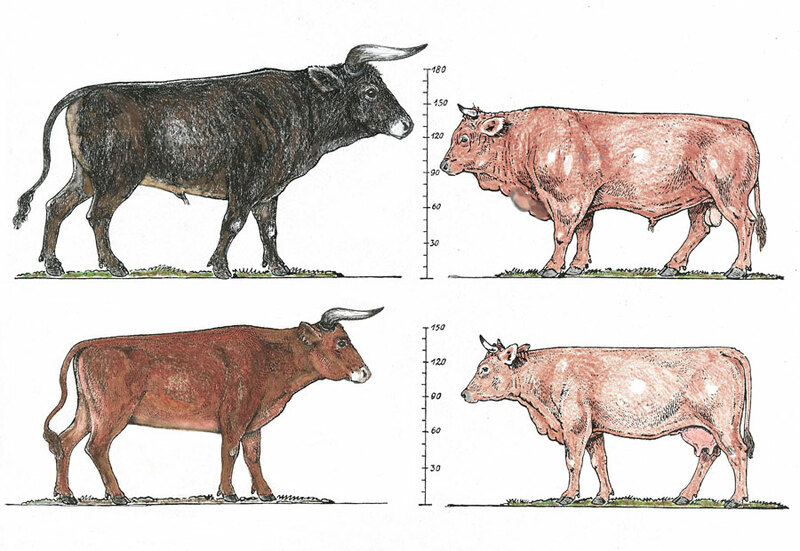 On the origin of cattle: how aurochs became cattle and colonized the world. Evolutionary Anthropology 19: 148-157. Barker, G. (1985). Prehistoric Farming in Europe. Cambridge: Cambridge University Press. Bollongino, R., Burger, J., Powell, A., Mashkour, M., Vigne, J. D. & Thomas, M. G. (2012). Modern Taurine Cattle Descended from Small Number of Near-Eastern Founders. Molecular Biology and Evolution. Epstein, H. & Mason, I. L. (1984). Cattle. In Evolution of Domesticated Animals. Eds. Mason, I. L. Essex: Longman Group. Felius, M. (1995). Cattle Breeds, an Encyclopedia. Doetinchem: Misset Uitgeverij. Groeneveld, L. F., Lenstra, J. A., Eding, H., Toro, M. A., Scherf, B., Pilling, D., Negrini, R., Finlay, E. K., Jianlin, H., Groeneveld, E., Weigend, S. & The GLOBALDIV Consortium (2010). Genetic diversity in farm animals: a review. Animal Genetics 41: 6-31. Helmer, D., Gourichon, L., Monchot, H., Peters, J. & Saña Segui M. (2005). Identifying early domestic cattle from Pre-Pottery Neolithic sites on the Middle Euphrates using sexual dimorphism. In: Vigne, J-D., Helmer, D. & Peters, J. (Eds). First steps of animal domestication. New archaeozoological approaches. London: Oxbow Books: p.86-95. Hodges, J. & Payne, W. J. A. (1997). Tropical Cattle: Origin, Breeding and Breeding Policies. Iowa State Press. Kumar, S., Nagarajan, M., Sandhu, J. S., Kumar, N. & Behl, V. (2007). Phylogeography and domestication of Indian river buffalo. BMC Evolutionary Biology 7: 186. Lenstra, J. A., Felius, M. & Theunissen, B. (2014). Domestic cattle and buffaloes. In Ecology, Evolution and Behaviour of Wild Cattle. Implications for Conservation. Eds. Melletti, M. & Burton, J. Cambridge: Cambridge University Press. Melletti, M. & Burton, J. (2014). Ecology, Evolution and Behaviour of Wild Cattle. Implications for Conservation. Cambridge: Cambridge University Press. Wiener, G., Jianlin, H. & Ruijunhttp, L. (2003). The Yak. Bangkok: FAO. Zhang, Y., Vankan, D., Zhang, Y. 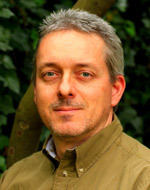 & Barker, J. S. (2011). Genetic differentiation of water buffalo (Bubalus bubalis) populations in China, Nepal and south-east Asia: inferences on the region of domestication of the swamp buffalo. Animal Genetics 42: 366-377.